Disappointment about unused talents and lack of drive or results on one hand and feelings of being rejected, underestimated, thwarted or denied on the other hand. Accusations against society not being able or willing to give their very talented citizens their due places to participate and contribute what they are worth. Accusations in return that they do not perform as might or should be expected and that they should back down as long as their performance has not improved. It definitely takes conscious effort not to keep resonating to this resentment and to extensive lamentations about the gifted adult condition that are not very different compared to ten, twenty or more years ago. After all, many XIPs carry old and fresh wounds caused by experiencing disappointment and rejection. But what can one do to break out of this pattern? In my view, the central issue is that being uncommon often leads to uncommon challenges in finding one’s way in life and work. The tricky part is not being aware that these challenges exist and as a result becoming overwhelmed by one or more of them. That is where the need comes in for properly managing this uncommonness – a gift you did not ask for – as part of actively enjoying it. What does being uncommon mean to you? For some people this is not an issue, for others it is a long struggle with their memories and their environment. How do you discover your personal extra strengths and weaknesses. They are a challenge because they are uncommon too and may not be readily seen or accepted by one’s environment and by oneself. How do you find your way in dealing with your own and other people’s expectations of excellent results, and with the natural resistance against ‘abnormal’ behaviour. Do you dare to sail beyond the horizon? In my vision an XIP should be actively involved in finding out how his/her extra qualities can be used effectively. It is in line with a need for autonomy, one of the five characteristics of Xi. You can take up those three challenges by giving consciously and regularly your attention to the three so called Practices. That was the very reason to call them ‘Practices’: They need cyclic attention, because your challenges develop along with your personal development. One might wonder: “Is that all there is to it?” But this is a mouthful!. 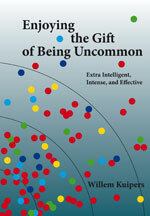 In my book Enjoying the Gift of Being Uncommon they are extensively described. In this Knowledge part of the website each Practice has its submenu with a number of pages to give an impression of its various aspects.